Kyle Corbett is a former CIA agent and aerospace engineer. Petra Leigh is an engineer and computer expert. Together they make as unlikely a couple but one that is enjoyable to follow. The fact that both get involved in activities involving the CIA and the Soviets and others makes the enjoyment that much better. Corbett is a man in his mid 50's, a former CIA operative whose love of and understanding of airplanes was of considerable importance to the Agency. His skills in design and planning, coupled with his knowledge of what the Agency was trying to accomplish in the field of clandestine aerial intelligence gathering, made him a vital part of the development cycle from the days of the U2 to the creation of the SR-71 and beyond. He was seconded to the private corporation tasked with creating the newest in stealth technology, not to as offensive weapons such as fighters and bombers but as eyes in the sky more maneuverable and timely than satellites. But someone somewhere in the upper echelons of the Agency decided a few years before the first book that Corbett knew something he either was not supposed to know or was a danger knowing and his best friend, fellow agent Dar Weston, was tasked with eliminating him. The occasion was a planned fishing trip and the method was a bomb put on the boat. Weston used an excuse to head back to the cars to get something, the bomb exploded, and Corbett, the potential threat, was no more. Petra Leigh was the niece of Weston and, being an only child, was the subject of considerable doting on his part. At least, that was how she perceived things. Now a 22-year old highly intelligent and extremely independent woman, she was determined to continue her education at a university where she could use her brain for something more than just being a socialite wife. Being raised in considerable wealth, she did not have to worry about working to make a living but she was set in her plan to make her own mark. What she did not know, and only Weston and her parents knew, was that she had been the result of a love affair between Weston and an Israeli agent. When the woman died in child birth leaving Weston with a daughter he knew his line of work would not allow to be raised properly, he turned the infant over to his sister and her husband, a couple unable to conceive. They raised her as their own with an uncle nearby who had more than normal interest in the child. There was, however, one other person who had known about the adoption and that was Weston's former best friend, the long deceased Kyle Corbett. The two-book series concern activities regarding highly advanced aircraft able to greatly affect global decisions through their ability to gather and actually manipulate intelligence. Corbett, a man not quite as dead as believed, upon learning of a particularly crazy plan to deceive the Soviets that also had the imminent danger of backfiring, decides to come out of hiding and act on his own to avert a disaster. Knowing that the person best able to stop him stopping the plan was his old friend, Weston, he took as hostage at the outset of his actions the one person Weston would not be willing to lose - his own daughter. For much of the first book, as agents from the NSA and the CIA and the Soviet bloc all try to carry out their own plans and then struggle to adjust to Corbett's intervention, Corbett and Leigh go through an interesting courtship. What started as a kidnapping turns to something else and things become very interesting. In the second adventure, the relationship remains as strong as ever but the problem faced by the two is considerably different and the intelligence community that tried to kill Corbett on more than one occasion now finds it desparately needs him. And Corbett needs Leigh. Note: these two books have been combined on some lists as being part of the Aerospace Systems series along with a book in the middle entitled The Nemesis Mission (1991). One of the main characters in that book was a man named Wes Hardin. Hardin also appears in, though not in a starring role, in Butcher Bird. 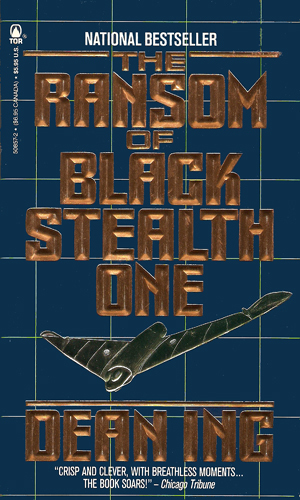 To keep the Soviets far back in stealth technology, the CIA decides to let them steal an older model but Kyle Corbett rises from the dead to steal the real thing. Now both the Soviets and the Americans are after him but he has the help of Petra Leigh, first his captive then his colleague. Someone has stolen an incredible aircraft capable of shooting beams from its "eyes" which can fry a victim's brain and the Americans must find a way to stop the killing. They need to help of Leigh and her lover, the renegade pilot and former CIA agent, Corbett. 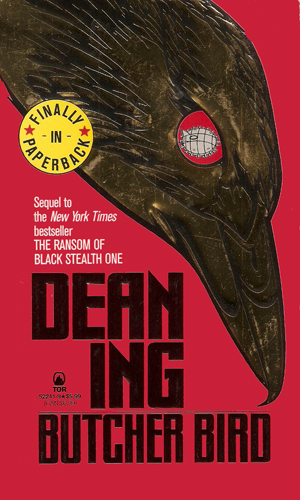 Without any doubt, one of the absolute best in business when it came to writing techno-thrillers during the 80s and 90s, especially when it came to using aircraft in the plot, was Dean Ing. His terrific knowledge of the industry coupled with his imagination and his immense writing skill put him at the top. This series belongs in the spy genre just as much as it belongs in the military technology genre because the people controlling and using the technologies, not to mention the ones who want desperately to get their hands on it, as Intelligence agencies. Not being a pilot, and not having any desire to become one, a lot of the tech-speak that takes place in the books are far over my head but one of the benefits from having such a good writer tell the story is that I can almost understand what is being said - and the parts I do not understand do not seem that vital. I get the gist of what is happening and that is the main thing. I really like the aging and caustic Corbett and really, really liked the impertinent Leigh. I could have taken more of him and would never say no to more of her.